We planned to do the North Rim Trail loop on this trip. 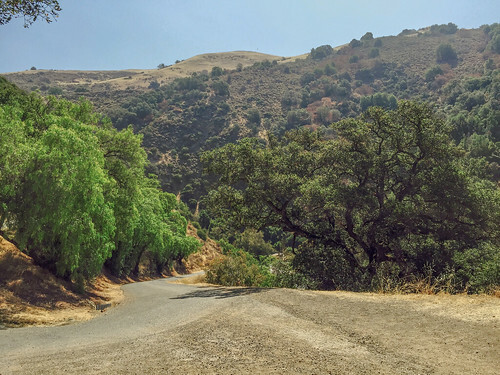 The trail begins as a paved, uphill road and rolls over to a dirt road after some distance. 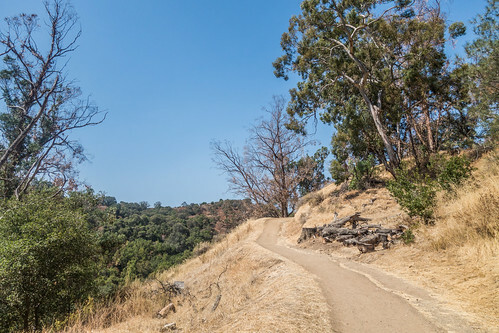 As you can see from the pictures (and from the satellite map later), the North Rim Trail, Todd Quick Trail, and Eagle Rock Trail are not one bit shaded. All the dry, open grasslands project the severity of drought in California. Apparently, no amount of heat deters people. It was pleasant to come across several groups, some with kids, hiking up to the Eagle Rock Overlook. It is just a quarter-mile (one way), out-and-back detour from the North Rim Trail. Treading the Eagle Rock Trail, in the heat and on an uphill slope, was worth the sweat. 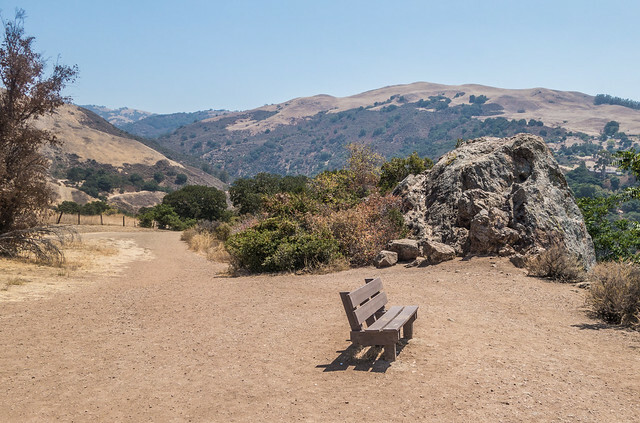 The trail lands you at the top of a cliff that serves as a scenic vista point for the entire Santa Clara valley. 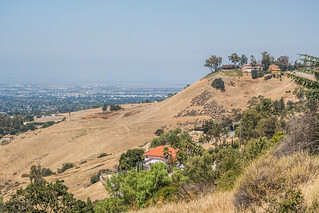 You can see the San Jose downtown in the center of the valley (spot the tall buildings) and the entire range of Los Gatos hills at the far end on the west. On the east, you can see the south end of the San Francisco bay. And then, of course, there was also the Eagle Rock. We stopped here for a short banana-and-water break. There were more folks cycling the North Rim Trail than walking it. 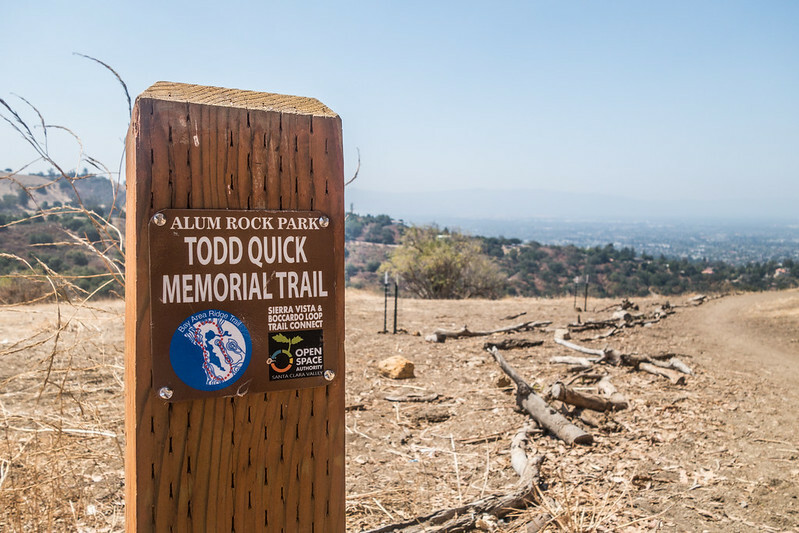 Before going on the Eagle Rock Trail, we also hiked the Todd Quick Trail (though we went a bit off route on the Weather Loop Trail) and it has quite an incline. 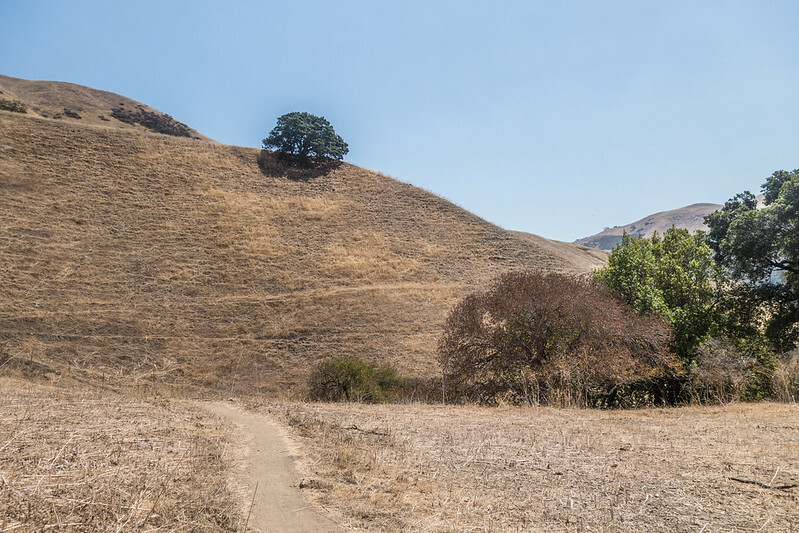 The Sierra Vista Open Space Preserve is just east of the Todd Quick Trail. 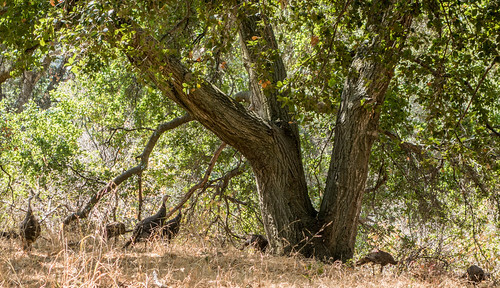 We spotted a huge flock of turkeys on the Todd Quick Trail. After completing the whole stretch of North Rim Trail, we took the Penitencia Creek Trail (via Horse Trail) to complete the loop and get back to our parking spot. The Penitencia Creek Trail was a piece of cake in comparison to what we had just walked, being almost flat and completely shaded. A good 5-mile hike this was. But the greener patch on the other side of the hill – the South Rim Trail – seemed more promising, what with all the tree cover. South Rim Trail was next on our radar of hiking trails. 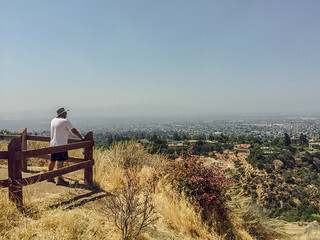 Inspiration Point – provides a vista for the Santa Clara valley and a view of the Eagle Rock. 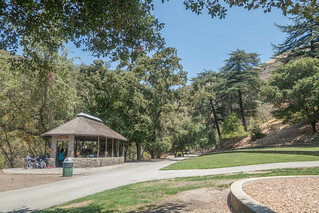 There are a number of picnic areas, both reservable and non-reservable, all along the Penitencia Creek and they are well placed under the shade of trees, so they offer great spots for outdoor get-togethers and family outings. There is a gazebo and several barbecue pits. Almost all the picnic areas were reserved either for a birthday party or a barbecue session or just a group picnic. The park also offers a few trails for horseback riding. There is a soft drink and bottled water vending machine near the Youth Science Institute. 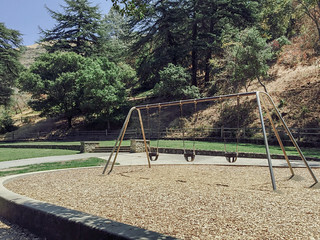 Parking Lot: The main parking lot for the Alum Rock Park is at 15156 Penitencia Creek Rd San Jose, CA 95132, at the park entrance, but it offers very limited parking space. 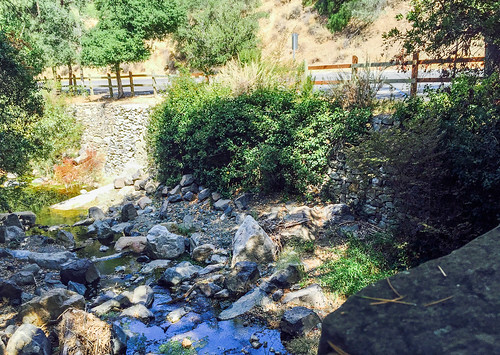 There are five more parking lots down the Penitencia Creek Rd and Alum Rock Falls Rd. 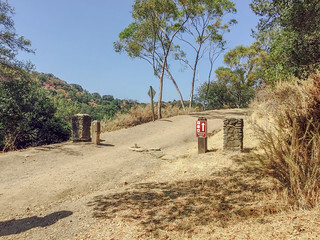 For the North Rim Trail, we started our hike from the eastern end, for which we parked near the Youth Science Institute (15289 Alum Rock Falls Rd, San Jose, CA 95132). This is the last parking lot in the Alum Rock Park. 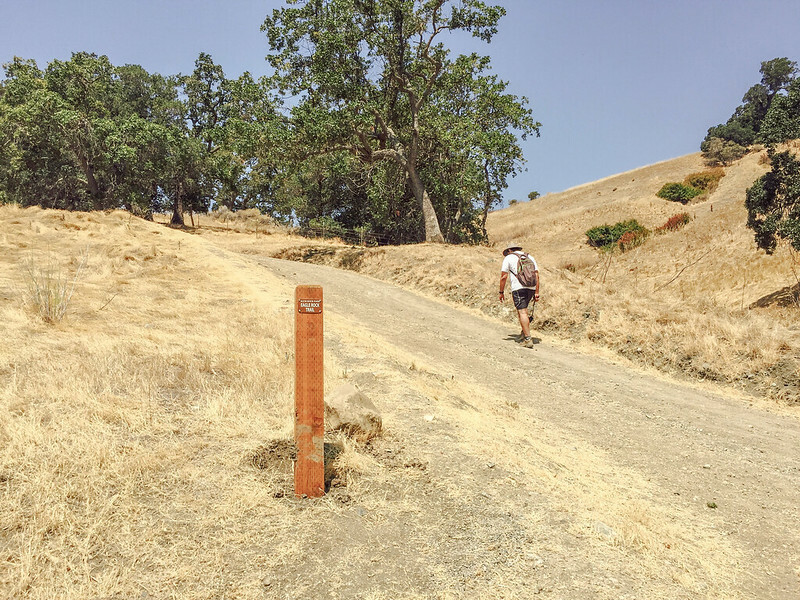 You can also start the North Rim Trail hike from the western end and park at 15186 Penitencia Creek Rd, San Jose, CA 95132, USA. Parking Fee: $6. Both cash (exact change required) and card are accepted. Automated pay stations exist only at the main parking lot and the first and last parking lots after that. Restrooms: Restrooms are available close to all the picnic areas and parking lots. There is one just next to the Youth Science Institute. Exposure to sun: The North Rim Trail and Eagle Rock Trail are largely exposed. The Todd Quick Trail has a bit of tree cover. 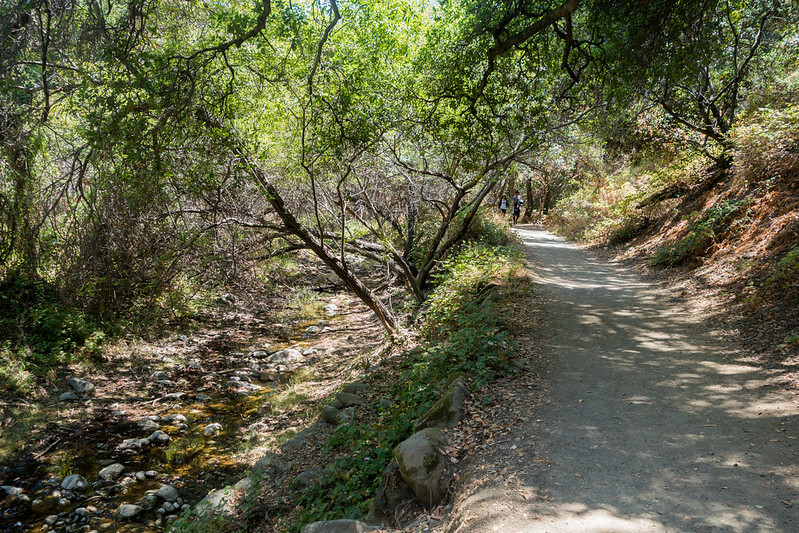 The Penitencia Creek Trail is very well shaded and is pleasant to hike with a creek running alongside. Crowd: Moderate. A lot of people trek to the Eagle Rock Overlook to see panoramic views of the valley.